What Else Can I Expect From an Online Bachelor's in Finance Program? What Can I Do With a Bachelor's in Finance Degree? What Will I Learn in My Bachelor's in Finance Program? If you have an interest in business and management, gaining an online finance degree can open up countless career opportunities. This is particularly the case in today's ever-changing financial and economic climate: modern technology has created new and exciting ways to analyze and manage financial matters, and an online finance degree will prepare you with tools and skills you will need to excel in the field. Those who pursue careers as financial analysts and managers can earn a salary as high as $91K per year, making a bachelor's degree in finance a sound investment. You can pursue your finance degree online through one of the many great and affordable programs that feature asynchronous and even hybridized curriculums, which allows you to earn your degree on your own terms and timeline. Today's online finance degree programs feature innovative learning platforms and formats that make it easier to gain the skills needed to prepare for the challenging career paths available to you in the world of finance. HOW DO I GET A FINANCE DEGREE ONLINE? Applicants to online finance programs must typically meet minimum GPA requirements for transfer credits or high school studies. Some programs also require standardized test scores or work experience in the field. Read more here.. Graduates with an online finance degree can pursue careers as financial analysts, accountants, financial managers, and personal financial advisors. Read more here..
Finance degrees are worth it for those who want to pursue a career in business or pursue an MBA or other graduate degree in a related field. Read more here..
An online bachelor's in finance degree is a four-year degree that prepares students for entry-level careers in banking, accounting, and tax preparation. Read more here..
WHAT CAN I DO WITH A FINANCE DEGREE AND NO EXPERIENCE? Graduates with an online finance degree can pursue entry-level roles in a variety of business- and finance-related fields. They can gain work experience before moving on to a master's degree or an MBA program. Read more here..
Based in the University Park neighborhood of Miami, Florida International University lives up to its reputation by enrolling students across the nation and the globe. The university accomplishes this mission thanks to its slate of distance learning offerings, which includes one of the best online finance degree programs in the nation. FIU offers a 120-credit bachelor of business administration in finance program, which typically takes students four years of full-time study to complete. The curriculum provides a strong foundation in fundamental business topics with a focus on finance. As such, notable courses in the curriculum include strategic marketing, organization and management, financial management, intermediate finance, commercial bank management, and securities analysis. The curriculum does not include a thesis or capstone requirement. As most of the students who enroll in the program continue to work or raise families while earning their degrees, FIU delivers all online coursework asynchronously and never requires students to visit campus. Each prospective student must earn a minimum high school GPA of 2.5 and submit SAT or ACT scores to earn consideration for admission. Accepted students can begin the program in the fall, spring, or summer terms at FIU. Florida residents receive a discounted tuition rate. Operating out of Boston, Massachusetts, Northeastern University's enrollment and global profile have skyrocketed over the past decade. Northeastern owes that growth to two central factors: a significant increase in the enrollment of international students and the expansion of the university's distance learning programs. As such, Northeastern now offers an online finance degree to students around the world. Northeastern's online finance program focuses on accounting management. The program describes its mission as preparing students to "leverage assets, manage budgets, achieve financial efficiencies, and maximize investments." Its 120-credit curriculum usually takes the standard four years of full-time study to complete and includes courses in business law, financial accounting, financial reporting and analysis, and cost accounting. Students can also complete a capstone course in business strategy. Online students in the program can earn the degree without ever setting foot in Boston or attending a scheduled course, as Northeastern delivers all of the program's required coursework asynchronously. Prospective students can apply for admission to the program in the fall, spring, or summer terms. As the program primarily caters to working professionals, many of whom did not follow a linear path from high school to college, Northeastern does not list any admission requirements beyond a high school transcript or a GED. A public university that primarily focuses on research, Old Dominion University operates its central campus out of Norfolk, Virginia. ODU originally opened as a division of the College of William & Mary but became its own university in the 1960s. ODU has since become one of the nation's preeminent providers of online programs, offering its first course through distance learning via satellite in 1994. The school's online offerings now include an online bachelor's degree in finance. The program's 120-credit curriculum usually takes four years to complete and includes courses in foundational areas such as marketing, financial management, and operations management, as well as macro and microeconomics. Unlike some peer programs, ODU's finance degree offers a varied delivery method, combining synchronous and asynchronous courses. Online students can either complete the entire finance degree at ODU or enroll in the program as degree completion students. Transfer students may bring up to 90 approved credits with them when they enroll at ODU. Furthermore, thanks to the Guaranteed Admission Agreement with the Virginia Community College System, local students with associate degrees can easily transfer into the school's finance program. Though ODU does not allow out-of-state online students to pay in-state tuition, they pay less than $40 more per credit than Virginia residents. Based in Springfield, Missouri State University originally opened in the early 20th century, but has since expanded its disciplinary offerings to offer programs in a variety of areas. Additionally, Missouri State has expanded its distance learning presence in the past few years and now offers an online finance bachelor's degree. The online finance program at Missouri State requires students to complete 120 credits before graduating, which normally takes the standard four years of full-time study. The program's curriculum prepares students to take the chartered financial analyst (CFA) level 1 exam, although students do not need to strive for CFA status if it is not relevant to their career goals. The curriculum includes a variety of field-specific courses, including managerial accounting, computer forensics/information technology auditing, and fraud examination. Job titles for past program graduates include financial analyst, financial planner, banker, broker, loan officer, and asset manager. The program aims to fit into the schedules of busy working professionals by delivering its coursework asynchronously, without any in-person requirements. Each applicant must submit evidence of a minimum high school GPA of 2.5. The program charges out-of-state online students the same tuition rate as Missouri residents. Operating out of Trenton, New Jersey, TESU takes its name from the enigmatic American inventor, known for his reputation as a self-directed learner. As such, TESU overtly focuses on providing distance learning opportunities to working professionals. The school lists its mission as "a public university proudly serving the needs of busy adults -- anytime, anywhere -- since 1972." The online finance program at TESU ultimately awards a bachelor of science in business administration degree. The 120-credit, four-year curriculum combines high-level finance classes with broad coursework in foundational business areas. Notable courses in the curriculum include principles of management, financial accounting, managerial accounting, commercial banking, risk management, and capital budgeting management. Each student in the program must also complete a business administration capstone course. Staying true to its mission of flexible education for working professionals, the program delivers all of its coursework asynchronously and never requires students to visit the campus in Trenton. Each applicant must submit evidence of a minimum 2.0 high school GPA. Additionally, all applicants must be at least 21 years old unless they serve in the United States military, in which case they must be at least 18 years old. Regis University, a Roman Catholic, Jesuit university based in Denver, Colorado, originally opened in New Mexico in the 1870s thanks to the work of a collective of Jesuits exiled from their home in Italy. Over the years, Regis gradually expanded the variety of its programs and now offers many of its strongest programs through distance learning. Regis now offers one of the nation's best online finance degrees. The online finance program at Regis requires students to complete a standard 120-credit, four-year curriculum before graduating. Notable upper division courses in the program include money and banking, ethical decision-making in business, business laws, fundamentals of investments, and advanced corporate finance. Each student must complete either a capstone course in business strategy or a capstone project in applied finance. Regis' programs cater to the working professionals who make up much of its online student body by delivering all program coursework asynchronously, never requiring students to visit campus for any reason. Though Regis does not list any minimum GPA thresholds or standardized test requirements for admission, each applicant must submit evidence of at least some professional work experience, as well as a high school diploma or GED. Many applicants can also earn prior learning credit for college courses, professional certifications, or military students. Each applicant works with a dedicated admissions counselor throughout the enrollment process. Located in the city of Manchester and the town of Hooksett, Southern New Hampshire University originally opened its doors in the 1930s as an accounting school. In recent years, the school greatly expanded, earning a place among the nation's fastest-growing schools. SNHU owes a large part of that growth to the expansion of its distance learning programs, which enroll students around the nation and the globe. SNHU blends its new and old identities by offering an online finance degree. The online bachelor's program in financial planning at SNHU requires students to complete a 120-credit curriculum that typically takes four years of full-time study. Notable courses in the curriculum include business systems analysis and design, managerial accounting, financial accounting, and financial plan development. Each student must also complete a capstone course in strategic management and policy. Like the majority of the online degrees at SNHU, the financial planning program delivers all coursework asynchronously and never requires students to visit campus for any reason. The program does not list any admission requirements beyond proof of a high school diploma or GED. Transfer applicants may bring up to 90 approved credits with them when they enroll. All students enrolled in the program can pay in-state tuition no matter where they live. Military members and their spouses who enroll in the program may receive discounted tuition rates. Originally founded in 1889 in the titular city of Commerce, TAMUC is the Lone Star State's fourth-oldest university. Though the university traditionally catered to local and resident students, TAMUC expanded its reach in recent years by offering several of its strongest programs through distance learning. As a result, TAMUC now features one of the nation's strongest online bachelor's in finance degree programs. The online finance program at TAMUC ultimately awards a bachelor's of business administration degree. As such, the curriculum combines foundational business courses with finance-focused coursework. TAMUC describes coursework as focusing on both day-to-day business operations and big-picture business ideas and strategies. Noteworthy courses in the 120-credit, four-year curriculum include advanced financial management, principles of investments, economic forecasting, international business strategy, and data and information management. The curriculum prepares students to sit for the chartered financial analyst and certified financial planner examinations. TAMUC created the program with working professionals in mind, delivering all online coursework asynchronously and eliminating all in-person requirements. Graduates of the program work at companies such as Southwest Airlines, JP Morgan Chase, Fidelity Investments, and Raytheon. Although the program does not list any minimum GPA requirements, all prospective students must submit SAT or ACT scores to earn consideration for admission. DBU, a private, Southern Baptist university, primarily focuses on the liberal arts. Originally opening as a two-year junior college, DBU has since expanded its slate of programs, eventually earning senior college status in the 1960s. The school now offers several of its programs through distance learning, including an online finance degree. The online finance program at DBU requires students to complete 120 credits, an undertaking that usually requires four years of full-time study. Noteworthy major courses include information systems for management, securities analysis, corporate financial management, and principles of financial and managerial accounting. The program's curriculum does not include a capstone or a thesis requirement. As many of the students who enroll in the program continue to work or raise a family while going to school, the program delivers all coursework asynchronously and never requires students to visit campus. DBU does not list any admission requirements beyond a high school diploma or a GED. Transfer students may bring up to 90 approved credits with them when they enroll in the program. As a private university, DBU does not distinguish between Texas residents and out-of-state students, charging all learners the same tuition rate, regardless of their location. Operating campuses in both Houston and Pasadena, Texas, UHCL originally opened its doors in the 1960s in part thanks to the arrival of the Manned Spacecraft Center near Clear Lake. The University of Houston began offering courses in relevant fields to NASA employees before eventually evolving into UHCL. Currently, UHCL offers programs in disciplines beyond physics and engineering, including an online finance degree. The online bachelor's in finance at UHCL functions as a degree completion program. All students in the program must complete an associate degree's worth of general education requirements elsewhere to earn admission to the program. As such, the program accepts approximately 60 credits of approved courses from transfer students. Once they earn admission, students complete two years of upper-level finance and business courses at UHCL. The curriculum explores real estate investments, investment banking, financial planning, financial statement analysis, commercial banking, and corporate finance. UHCL strives for flexibility, delivering all of its coursework asynchronously and never requiring students to visit any campuses in person. Applicants do not need to meet any minimum GPA requirements. However, all applicants must submit either SAT or ACT scores to earn admission consideration. The program offers fall and summer start dates. Located in the eponymous city of Birmingham, UAB originally opened in the 1930s as an academic extension center. Operating out of an old house in Birmingham, the extension center met the educational needs of the local working population. UAB expanded over the years but maintained its deep roots in providing education to working professionals. Distance education offers a natural evolution to those roots, and UAB now offers several of its strongest programs through distance learning, including an online finance degree. The online finance program at UAB requires students to complete 78 credits in the major before graduating. Most students take four years to earn the degree. Notable courses in the curriculum include equity portfolio management, principles of real estate, financial research methods, intermediate financial management, and financial accounting. All students also complete a capstone experience in strategic management in addition to three credits of experiential requirements through an internship or a similar experience. Aiming for flexibility, UAB delivers all of its coursework asynchronously and never requires students to visit campus for any reason. All applicants must submit evidence of a minimum high school GPA of 2.0. Furthermore, all applicants must submit either SAT or ACT scores. Though UAB prides itself on its service to Alabama's students, out-of-state online students who enroll in the finance program pay the in-state tuition rate. A private, interdenominational Christian university based in Longview, Texas, LeTourneau originally opened its doors in 1946 as a technical institute operating out of an abandoned World War II hospital. In modern times, LETU offers programs in four areas: education, business, aeronautical science, and engineering. The university also offers programs for working professionals -- including an online finance degree -- at extension sites in Houston, Dallas, and Longview, as well as through distance learning. The online finance program at LETU takes the form of a bachelor of business administration in finance. The finance bachelor's at LETU requires students to complete 120 credits to graduate, and most students graduate in four years of full-time study. Noteworthy courses in the curriculum include organizational behavior, quantitative methods, international business, and business ethics. All students in the program must also complete courses in biblical literature and biblical theology for Christian life. The program's curriculum does not include a capstone or thesis requirement. LETU delivers all online coursework asynchronously and never requires students to visit campus, making the program accessible for working professionals. The program does not list any minimum GPA or standardized test admission requirements. As a private university, LETU charges all students in the online finance program the same base tuition rate, no matter where they live. The largest regional comprehensive university in the Land of Enchantment, Eastern New Mexico University (ENMU) serves more than 12,000 students from its campus in the city of Portales. Known for small class sizes and affordability, the school built a thriving digital college, offering more than 30 programs in an array of disciplines. ENMU's online finance degree takes the form of a bachelor's in business administration (BBA) with a concentration in applied finance. The degree carries accreditation from the prestigious Accreditation Council for Business Schools and Programs (ACBSP). ENMU's bachelor of business administration applied economics and finance program takes place entirely online. Professors use asynchronous coursework, recorded lectures, and videoconferencing to deliver course material to students. To complete the 120-credit curriculum, distance learners must fulfill 38 credits of the university's general education requirements, 38 credits in the business foundation, 21 credits in the business core, three credits in international classes, and 18 credits in the finance emphasis area. Degree candidates gain a solid foundation in traditional business skills like accounting, spreadsheets, marketing, and statistics while also developing executive skills in management. The applied finance concentration delves into financial modeling, macro economics, and managerial finance. Students can add a minor or additional focus area in a complementary field to tailor their program to their career goals. They must maintain a cumulative 2.25 GPA throughout the program. ENMU requires applicants to submit transcripts, which should show a minimum 2.5 GPA and SAT scores. One of the nation's largest online schools, UMUC focuses on educational opportunities for non-traditional students. Part of the University of Maryland system, the digital campus serves more than 60,000 students across the globe. UMUC offers an online bachelor's degree in finance that examines intensive case studies to explore financial strategy and financial management. The program also gives participants the opportunity to add a Certified Financial Planner component that readies them for the CFP exam. UMUC's finance bachelor's degree program lays the foundation for careers in contract management, portfolio analysis, financial planning, banking, risk assessment, investments, and insurance. The 120-credit curriculum balances solid business basics with an in-depth study of finance. Degree candidates must earn 36 credits in the major itself, 40 credits in general education, and 43 credits in a related minor or electives. Students must maintain a minimum 2.0 GPA and earn a C or better in all credits applied to the major or minor. UMUC accepts as many as 90 transfer credits toward the program and grants credit for an array of experiences, including military service, credit by exam, workplace training, and professional credentials. The university formats all courses asynchronously and utilizes free digital material, including ebooks, websites, software, and interactive exercises, rather than textbooks, in almost every course. Classes are scheduled in accelerated eight-week sessions. UMUC does not require the SAT or ACT for admission. Set in one of the nation's most diverse cities, UHD specializes in undergraduate and graduate degree programs aimed at career preparation. The public institution offers a wealth of programming through the internet, including an online finance bachelor's degree. The 120-credit bachelor of business administration in finance program provides aspiring financial planners and bankers with the tools they need to analyze data, assess risk, and use technological solutions to increase revenue and business productivity. The UHD curriculum consists of 42 credits in the school's general education core, 48 in the business core, 12 in the finance major, and six in electives. The degree plan also allows students to select from one of two main tracks -- corporate finance or investment management -- and add a complementary minor in accounting, marketing, or economics. Distance learners develop the tools they need to enter the business world, attend graduate school, or sit for the CFP, Certified Treasury Professional, or Chartered Financial Analyst (CFA) exams. Most professors employ an asynchronous format for classwork. High-achieving program participants can join the UHD Chapter of the Beta Gamma Sigma, finance honor society, the Business Administration Council, or the Financial Management Association. UHD boasts a generous transfer policy, accepting credit from community colleges, international sources, and credit by examination. Transfer students with more than 15 credits must hold a 2.0 GPA or higher. The elite Association to Advance Collegiate Schools of Business-International (AACSB) provides accreditation to the UHD's Davies College of Business. Founded in 1971 to meet the higher education needs of working adults, Metropolitan State offers a full slate of online degree programs. Part of the Minnesota State University system, the St. Paul-based institution enrolls more than 11,000 students, 95% of whom transfer from other schools. 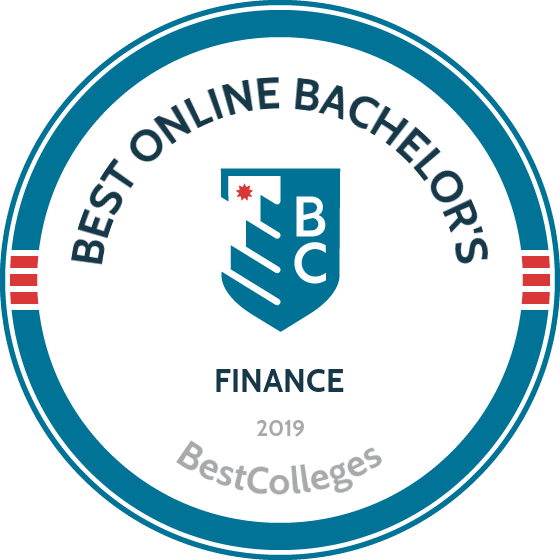 Business ranks as the second-most popular major at the university, and the Metropolitan State College of Management hosts an online bachelor of science in finance that lays the groundwork for a career in investing, financial analysis, and banking. In Metropolitan State's 120-credit online finance degree program, students apply mathematical, statistical, and economic-based skills to financial decision making. The curriculum emphasizes not only strong business acumen but written and oral communication skills, quantitative thinking, critical analysis, and decision making. Other core competencies include evaluation of the value of financial assets like stocks, bonds, and derivatives, designing an optimal financial portfolio, and using sound financial judgement to drive corporate decision making. Students must complete the College of Management's foundation courses with a C- or better before declaring this major. This 22-credit program includes bedrock business topics like macro and microeconomics and accounting, as well as college algebra, statistics, and information technology. From there, participants move on to the 20-credit business core and must take eight credits in the finance major. Sixteen more credits in electives allow for program customization before the final capstone project. The entire program takes place asynchronously online. Non residents pay the same tuition costs as Minnesota residents. Private, nonprofit Davenport University (DU) created its Global Campus to provide affordable online education to people beyond its home campus in Grand Rapids, Michigan. The mid-sized institution offers an online finance bachelor's degree as part of its bachelor of business administration program. DU's 120-credit course of study enjoys accreditation by the International Assembly for Collegiate Business Education (IACBE). Designed in partnership with the business community, the program is also registered with the CFP Board of Standards. This credential automatically guarantees graduates eligibility for the CFP exam without having to go through the lengthy application process. The university considers the degree ideal preparation for those interested in continuing on to an online master's in finance degree. DU's curriculum gives students a broad base of knowledge in the basics of finance, including budgeting, data analysis, investments, and portfolio management. Learners can elect to pursue a financial planning specialty or explore nuanced areas like international business, estate planning, healthcare, and real estate. Most courses run asynchronously, but some professors schedule occasional real-time meetings. DU prides itself on small class sizes and individualized attention from professors. All program participants must complete the two required cores at the David Maine School of Business, foundations of excellence and foundations of business. The finance major involves 43 credits, and students must select a culminating experience. Options include an internship in accounting, finance, or business, or two capstone projects. A leader in internet-based education for the past 20 years, National University (NU) offers an online finance degree that takes full advantage of the digital environment. NU runs all classes in an asynchronous format, utilizing fast, four-week sessions that allow students to concentrate on a single course at a time. Classes begin monthly, making it easy to jump in and get started. Aimed at working adults, all coursework takes place across the web and remains available around the clock. NU's bachelor of science in financial management examines the "art and science" of wealth creation, investment, and administering financial services. Offered by the university's school of business and management, the 180-quarter-unit program carries an accreditation endorsement from the International Accreditation Council for Business Education (IACBE). Curriculum gives students a theoretical and practical education in business essentials like micro and macroeconomics, accounting, and marketing and also in subjects like working capital investment, risk management, insurance, and tax and legal issues. Program participants form virtual teams and use case studies to create strategies and make financial decisions based on real-world data. Founded by a veteran, NU grants military personnel and their families substantial tuition discounts. The school also extends generous transfer credit for service in the armed forces, previous college work, and work experience, Students may bring as many as 135 quarter units from approved sources. Established as a small teacher's college in 1911, East Tennessee State University (ETSU) now offers dozens of majors both on its campus in Johnson City and online. The mid-size public university is as one of the largest members of the State University and Community College System of Tennessee. ETSU's online finance program offers students several unique specialization options, including real estate, corporate finance, and banking concentrations. ETSU's bachelor of business administration in finance requires distance learners to earn 120 total credits. A hybrid program, the BBA takes place largely online, in asynchronous fashion, but students do need to visit campus for several classes. The curriculum specifies 41-42 credits in general education courses, 36 credits of BBA core classes, 27 credits in the area of concentration, and 16 credits in electives. A real estate concentration covers an area of finance not usually included in most online finance programs. The specialization explores such topics as urban and rural economics, appraisals, real estate law, and real estate management. The Department of Economics and Finance promotes a solid grasp of business basics and problem solving skills in each of the three available tracks. All degree candidates must complete a senior business exam before migrating into the strategic management capstone course. Applicants must hold a 2.3 GPA from their previously completed college credits or acceptable SAT scores. ETSU requires that students complete 60 credits before entering into the BBA program, and they must maintain a 2.5 GPA during the program. Those admitted must earn at least 50% percent of their BBA credits through East Tennessee State. A public research institution in Tennessee's second-largest city, the University of Memphis offers an online finance degree through its digital campus, UofM Global. The 120-credit program enjoys some sterling credentials. Accredited by the esteemed AACSB, the degree boasts national recognition by the CFA Institute. Like all of UofM Global's offerings, the program takes place entirely online. UofM's bachelor of business administration in finance, with a concentration in business finance, focuses on decision making competencies concerning stocks, bonds, derivatives, foreign exchange, capital markets, budgeting, and financial management of corporate funds. The degree prepares students to develop investment portfolios, advise investors and corporate leaders, design financial products, analyze data, and understand the complexities of alternative investment options. Participants must complete all of the university's general education requirements, which typically takes place during the freshman and sophomore year. Prerequisites for all BBA candidates include elementary calculus, calculus I, and macro- and microeconomics. The university founded its virtual campus with flexibility and portability in mind, and most coursework runs asynchronously. Students may enroll as new freshmen with or without business experience or transferable credits. The university extends in-state tuition to all distance learners, and UofM Global students can access many of the same resources found on campus. These include tutoring, tech support, library services, career services, and advising. Northwood University (NU) created its BBA with specialization in mind. The conservative Midland, Michigan, nonprofit institution offers the degree with no less than 11 concentrations, including finance. Students who enroll in the online finance degree can further customize their course of study by concentrating in specialty areas including securities, taxes, banking, insurance, credit, trusts, and financial advising. Learners can also add a minor in operations and supply chain management. All of these offerings have the backing of the ACBSP. Though each student in the university's BBA in finance program must complete 123 credits, including general education requirements, NU sets them on their business course early. Finance majors begin their education in the field in their first semester with introduction to finance and principles of management. Business classes thread through each semester thereafter, readying participants for careers in trust offices, investments, CFO roles, risk assessment, and corporate banking. Graduates leave ready to sit for the Series 7 and DFP exams as well. All students must take Introduction to the Northwood Idea, a single-credit class in the school's conservative philosophies of the limited role of government, free enterprise, and property rights. Most coursework proceeds asynchronously, though some professors may schedule meetings in real time. The fast-track MBA in four years condenses the bachelor's degree into three intense years and the master's component into a single year. NU charges a competitive flat rate to all online students, excepting active military personnel and qualified veterans, who enjoy dramatic tuition discounts. With more than 20,000 students enrolled on its digital campus, Penn State's World Campus now ranks as the second-largest university in the 24-member Pennsylvania State University System. The virtual institution hosts dozens of web-based degrees, including one of the nation's best online finance degree programs. Penn State's 120-credit bachelor of science in finance holds accreditation by the standard-setting AACSB, which gives approval to less than 5% of the world's business schools. Penn State's finance curriculum consists of 43 prescribed credits in the major itself, including classes in business bulwarks like accounting, economics, marketing, and management. Students must then select from 46 credits of related coursework, and complete 45 general education credits. Some of these requirements overlap. Graduates leave with an understanding of the concepts and analytical tools needed to add value to a position in banking, investments, securities, and financial management. Most classes take place asynchronously, with no on-campus requirements. Designed in partnership with Penn State Erie's Behrend campus, the online bachelor of finance program focuses on professional credentials. Participants learn everything they need to sit for the CFA or CFP exams. The CFA Institute gave its seal of approval to Penn State's course of study, recognizing that it incorporates the CFA Program Candidate Body of Knowledge. Penn State's World Campus places no restrictions on the number of credits students may transfer. The school stresses that not all credits may apply to their major. It also stipulates that 36 credits of the last 60 credits of a degree must come from Penn State classwork. One of the five campuses of the University of Minnesota system, UMC now boasts as many online students as on-campus learners. The Crookston-based public institution made such a commitment to web-delivered education it distributes laptops to all of its students. UMC's online bachelor of science in finance takes participants through the inner workings of markets and investments, steeping them in such subjects as risk analysis, ethics, the law, and sound financial decision making. UMC's program takes a technological approach to finance, and students graduate with an understanding of how to use data in the analysis of risk. In addition to coursework in accounting, taxes, estate planning, financial institutions, and investments, program participants take classes in management information systems and must complete three credits of technology requirements. The university requires 120 credits total for a baccalaureate, including 65 credits in the major itself. Most classes run asynchronously, and students never need to visit Crookston. The university takes institutional pride in the small class sizes and mentor relationships among faculty and distance learners. Strong faculty-student relationships promote an applied knowledge, hands-on educational approach. UMC also sponsors an undergraduate research program that gives all undergrads a chance to design and conduct a research project. All distance learners pay in-state tuition. UMC claims a 93% placement rate of graduates in their fields. This degree includes summer terms. Founded as a women's Christian college in 1851, Columbia College (CC) transitioned into a private liberal arts college open to all learners. Located in Columbia, Missouri, the nonprofit institution now features locations in 13 states and Cuba, and it offers a full complement of web-based programs. The college hosts a pair of online finance degree programs as part of its bachelors of business administration. Distance learners can enroll in either a BA or BS in finance, both of which deliver a balanced education in investments, banking, portfolio development, and corporate management. CC's two programs differ slightly in their focus, though both require degree candidates to earn a total of 120 credits. The BA includes a six-credit foreign language requirement, while the BS does not but requires a few more credits in the major itself. Different rules apply to transfer credits between the two degrees. Students may transfer in as many as 48 credits toward a BS, but only 27 credits can go toward a BA. Beyond those differences, both degrees follow similar paths. Distance learners need to take about 40 credits in general education classes and 51 credits in business and management coursework. A finance major adds another 18 credits, and participants can customize their course of study using electives in areas like real estate, international finance, sports finance, and insurance. All classes run asynchronously in accelerated, eight-week terms. Six sessions per year allow undergraduates to earn their bachelor's in 3.5 years. Tuition remains the same for all distance learners, except for military personnel, who pay a lower rate. DeSales University, a private, Catholic university based in Center Valley, Pennsylvania, takes its name from Saint Francis de Sales. Since opening its doors in the 1960s, the school added ACCESS, its continuing education department, in the 1970s. Nowadays, DeSales offers several of its programs online, including various ACCESS programs, which primarily cater to working professionals. One such program is the school's accelerated online finance degree. DeSales' online finance program features a 120-credit curriculum which can take four years to complete, but many students graduate more quickly by earning credit for prior learning assessment, military service, and professional experience. Particularly noteworthy courses in the curriculum include introduction to risk management and financial management and institutions. Hoping to better fit the schedules of the working professionals who enroll in the program, DeSales delivers all program coursework asynchronously and does not require students to visit campus for any reason. DeSales, aiming for accessibility, does not list any admission requirements for the finance program beyond a high school diploma or GED, but any further qualifications can help students accelerate their progress toward their degree. Transfer students may bring up to 75 approved credits with them when they enter the program at DeSales. As a private university, DeSales does not distinguish between in-state and out-of-state students and charges all students the same base tuition rate. The fast-paced world of finance is a complex and high-stakes field, and those who are naturally analytic, confident, and comfortable with risk-taking and decision-making may do very well in an industry that offers unlimited opportunities with the right credentials. Students pursuing a finance degree online learn how capital markets and financial institutions function, including the principles of corporate finance, and how to execute an organization's financial policies. Because most of the subject matter is based on theory, the curriculum translates extremely well to an online learning environment. Financial Management: This course provides the tools necessary for making sound financial decisions at the enterprise level. Topics covered include a firm's capital structure, concepts in the time value of money, stock and bond valuation, capital budgeting, portfolio management, dividend policy, and derivative instruments. By examining actual cases faced by real firms, students are exposed to the challenges faced by managers and executives around the world and, in turn, students learn how to apply financial management concepts and techniques to real-world situations. Commercial Bank Management: This course analyzes the role of commercial banks in the financial system and focuses on understanding what banks actually do, how they make money, what risks they take, and how they manage those risks. Students learn how to analyze and evaluate bank financial statements, develop an appreciation for the complexity of risk in banking, and understand the role and responsibility of regulators. Statistics: Statistics is a branch of mathematics that pertains to the collection, analysis, interpretation, presentation, and organization of data. The course covers topics in general statistics, including basic sample descriptives, categorical data analysis, including odds and risk ratios, estimation and hypothesis testing. Data analytic projects are an integral part of this course, and the course places a particular emphasis on understanding and interpreting outcomes and findings. Economics: A discipline that examines the production, consumption, and transfer of wealth, economics includes the theory of consumer demand, production, distribution, pricing, and production in competitive industries. Students examine national income accounting and explore topics such as unemployment and inflation, as well as policies designed to combat these and other contemporary problems. HOW LONG DOES IT TAKE TO GET AN ONLINE BACHELOR'S IN FINANCE? Most online finance degree programs require the completion of 120 to 130 credits to graduate and take at least four years to complete. If that seems like a long time, consider programs that offer accelerated sessions of five, eight, or ten weeks, compared to the traditional 16-week semester. If you are a quick learner and have the time required to successfully complete a fast-paced program, you could graduate in less time by opting for an accelerated online distance education program. Other factors that determine the length of a program include requirements like a final capstone project, where students apply coursework to real-world business situations, or internships and practicums, which give students the opportunity to gain industry experience and increase employment options after graduation. Chartered Financial Analyst (CFA) certification demonstrates knowledge and competence in portfolio management, investment analysis, economics, and professional and ethical standards. Professionals who hold this license help individuals and organizations manage their investment portfolios. Because the certification process entails the successful completion of a three-tiered examination, the process can take upwards of 18 months (and at a cost of about $2,500) before licensure is granted by the non-profit CFA Institute. Certified Internal Auditor (CIA) certification demonstrates competence in risk control and information technology. In addition to a bachelor's degree, the Institute of Internal Auditors (IIA), the regulatory body governing licensure, requires individuals to have two years of internal audit experience before entrance to the three-tiered examination. You typically have to wait about 18 months to receive certification and it costs just under $2,000. Colleges and universities voluntarily seek accreditation to determine if their programs and faculty meet certification standards. When a school successfully meets accreditation standards, the institution is accredited and then regularly reassessed. Accreditation comes in several different types, including institutional, which refers to an entire institution, and program-specific, which relates to individual programs of study within an institution. National and regional accreditations also exist. As implied by the name, regional accrediting organizations operate in specific regions of the country, and they grant accreditation to those schools that meet their standards of quality. While national accreditation sounds more prestigious,this is not necessarily the case. Regionally accredited colleges are more academically-oriented, and prefer not to accept transfer credits from nationally accredited institutions because they haven't met the same standards. You may be wondering who monitors all the different accrediting agencies. The answer is simple: accrediting agencies apply to the U.S. Department of Education (DOE) for federal recognition, which is granted upon satisfying criteria set forth by the DOE. The DOE maintains a list of recognized accrediting agencies at its website. The Council for Higher Education Accreditation (CHEA), a regulatory body, monitors the quality of 60 institutional accrediting organizations, including regional, religious, private, career, and program-specific accrediting organizations. When you're shopping around for a college, don't just check if a school is accredited. Check that the accrediting agency is also recognized by the DOE or the CHEA. If the agency is not recognized, you may want to consider another choice. From accounting to managing and financial analysis, an online finance degree can prepare you for careers in a multitude of exciting and fulfilling fields. If you enjoy working as a part of a collaborative team, and if you have a knack for learning and using digital financial software like Microsoft Excel, a career in finance could suit you well! Those working in this field should be open to going above and beyond their basic expected duties. Professionals should be exceptionally reliable, as the world of finance requires pinpoint accuracy and consistency. An online finance degree will help you hone these important skills. Financial Analyst: Financial analysts primarily serve to guide individual clients and businesses in their investment practices by analyzing and assessing things such as stocks and bonds. Through analyzing these different methods of investment, financial analysts can recommend how their clients invest. A wide, current, and ongoing knowledge of business and economic trends is expected of those in this position. Accountant: Often known for helping clients prepare taxes, accountants also work as consultants for businesses seeking to lower costs and increase profits. Accountants analyze the financial records of their clients to help their businesses run at peak efficiency. Importantly, accountants also make sure that all financial statements are accurate and lawful. Financial Manager: Similar to an accountant, financial managers work to ensure the health of a business's finances through careful financial planning and analysis of investments and financial reports. Financial managers are expected to have an excellent understanding of new technologies used to create financial reports. Financial Services Sales Agent: Financial services sales agents work with clients to make them aware of all services available to them, and they provide guidance and advice on when to buy and/or sell various securities. Professionals in this field may also buy and sell securities and commodities like stocks, bonds, oil, and gold. Personal Financial Advisor: To help clients plan and achieve their financial goals, personal financial advisors work on a more personal, one-on-one level with their clients. Professionals in this field help clients navigate investment options, risks, and financial services. Investments: In this course, students learn about security markets and how they are organized. Students also learn about various legal aspects of investing and survey related processes. Corporate Finance: This course prepares students to manage corporate capital. Students learn about risk and return, policies, and how to forecast and plan for corporate investments. International Finance: Students in this course focus on making financial decisions in international settings, survey policies, and processes associated with these decisions. Accounting: This course provides students with a foundation in the basics of accounting. Course topics may include financial statement preparation, tax policies, and how to properly communicate associated policies to clients. Risk Management: Students focus on evaluating risk faced by individual clients and businesses in investments. Students learn how to effectively identify and manage risks, and how best to make risk management-related decisions. Careers in finance are growing at an impressive rate and median salaries for many jobs in the finance field are desirable. An online finance degree not only opens the door to high earnings but also provides the opportunity to entertain an array of career opportunities. Pursuing a finance online degree is the first step to entering one of these exciting fields. While most careers in the field of finance do not require special licensure or certification, there are a few that do. Beyond meeting requirements, gaining certification adds qualifications to your resume, which in turn adds a boost in hireability. When pursuing an online finance degree, it's wise to keep these various licensures and certifications in mind. Certified Financial Planner (CFP): By gaining CFP status, professionals are understood to be highly qualified in the field. CFP status evidences a professional's adherence to crucial governing principles, including confidentiality, professionalism, and integrity. This certification is earned through a test overseen by the CFP Board. Certified Public Accountant (CPA): As per guidelines and requirements set forth by the American Institute of Certified Public Accountants (AICPA), candidates officially become certified public accountants upon passing the Uniform CPA Examination. Many states require the completion of 150 semester hours of education before candidates may take the exam. Financial Risk Management Certification: Generally considered the highest qualification for financial risk management professionals, FRM certification is earned through an exam overseen by the Global Association of Risk Professionals. The certification helps distinguish risk management professionals stand out from their peers and may be particularly helpful in high-competition markets. The AFP's stated purpose is to aid its members and the organizations for which professionals in the field work. The organization also administers its certified treasury professional and the certified corporate FP&A professional certifications, and each year the organization hosts the largest conference for finance professionals in the nation. The AAFPB caters specifically to management accountants (for example, the organization operates the Institute of Management Accountants, founded in 1919). The group also administers its certified management accountant certification. The FPA is the premier organization among Certified Financial Planners. In addition to retreats and residency programs, the FPA offers an annual conference for finance professionals. As with any undergraduate program, students entering an online finance degree program must complete and file the Free Application for Federal Student Aid (FAFSA) in order to be considered for most forms of funding, including scholarships and loans. You can also work with your advisor or your school's career center to seek out paid finance internship opportunities. These opportunities can help fund your finance degree online while providing you with valuable career experience. Completing the Free Application for Federal Student Aid (FAFSA) is a crucial first step for any student with financial needs. Our FAFSA guide features a step-by-step rundown on the process and provides answers to several frequently asked questions.